Steve and I finally saw La La Land last week. My friend Robin just wrote a great piece about her strong family movie-going tradition and it made me wish we were doing a better job of keeping up. But at least we made it to the much-awarded film that everyone has been talking about, while everyone was still talking about it. For those not in the know, La La Land is a very imaginative tribute to old movie musicals, in a modern day setting. From the opening scene, a big dance number performed on top of cars in the middle of an LA Freeway traffic jam, you know that you are in for a different cinematic ride from the usual 21st century fare. This is a world where the young lovers break into song at the drop of a conversation, even floating to the top of the Griffith Observatory to waltz amongst the stars. I’m still sorting out my feelings about the movie (good acting, disappointing score), but after my return home I began to fantasize: what if my life was a big-screen musical? Well, for one thing, it might inspire me to dress better (the scrappy barista heroine of La La Land sports a wardrobe befitting an heiress.) I might buy a new pair of tap shoes. I took tap lessons back in my early performing days. My “shuffle-hop-steps,”while gratifyingly noisy, were light years from the fancy footwork in the Busby Berkeley extravaganzas of the 1930’s. I would abruptly quit my church job, right in the middle of worship, dancing up the aisle, pushing music director Ken off the organ bench as I masterfully improvised a haunting farewell tune. I would then read one of my stories to a small audience at Upper Dublin Public Library, one member of which would (randomly) be the top editor at Random House. She would ask me to expand my little tale to novel length, and immediately offer me a million-dollar advance. After some modest hemming and hawing, I would accept. My love life would be considerably more dramatic, though with the same co-star. Steve and I would exchange glances across our crowded kitchen, and perform a passionate tango as we argued about whose turn it was to take out the trash. In a poignant scene, I would imagine myself married to someone from a rival children’s theatre company. Now that I think of it, “Orela-la-land” has definite possibilities. Boogie-ing across the bridge over the tracks at Oreland Station to the tune of “Midnight Train to Georgia!” Flash mob at the Oreland Post Office! All my world is a movie set, right? And I am the star player! Lights, camera, action! Been feeling a bit discouraged lately about submitting my essays to various contests and publications, which would make sense if I was getting a pile of rejections. But I’m not. I sent one piece to one place and never heard back. Yet I always assume that, not only is a newspaper or magazine passing on my work, but the editor has passed my feeble effort around the office: “Hey guys, get a load of this! Hope she hasn’t quit her day job!” Faced with this (admittedly far-fetched) prospect, I decide to keep my work safely in my own computer. They can’t turn down what they never see, am I right? But this week reminded me that, for those who are determined to succeed, setbacks are an inevitable part of the process. On Thursday evening, I had the great pleasure of attending a concert with Julie, by the New York Philharmonic at Lincoln Center. I would have enjoyed the NY Phil had they been playing an orchestration of “Chopsticks,” but this was a dream program: Beethoven’s First Piano Concerto and Gustav Mahler’s First Symphony. I love Beethoven, but I ADORE Mahler. His sweeping compositions create a world of their own, a cascade of varied and brilliant musical ideas that somehow fit perfectly together. I recalled that Mahler had himself conducted the US premiere of this symphony, by this orchestra, in New York in 1909. What I had forgotten was the almost universal panning the piece had gotten from music critics when it was first performed in Europe. He never gave up, reworking it until it reached its final, triumphant form years later. Had Mahler pulled an Elise, the world would have forever been deprived of what has become a beloved masterwork. In my own home, I am watching as my baby grandson is learning to crawl. Peter is young to be approaching this milestone, but that is certainly not stopping him from trying. His tireless efforts have yet to propel him much of anywhere. Again, if Peter took after his Nana, he would just be lying on his quilt, assuming that magically one day movement would happen. But he persists, with no frustrated tears—even when he ends up flat on his face, again. One day, quite soon, his efforts will pay off, and we will have another small man in motion around the house. So what can I learn from a favorite composer and my darling grandbaby? Never give up! My little essays may be rejected for a while, but maybe not forever. The only true failure is not persevering. It’s Sunday afternoon, and I am looking at several of my recent pieces which are languishing on my Mac. I think I’m going to send my literary babies out, today, and just see what happens. They may be rejected outright, but I can’t worry about that. There are so many publications out there, after all. May I keep trying, and have faith that my audience is somewhere out there too. The Tuesday morning Bible study group at church has for years been ably led by Pastor Hy, an amazing 91 year old who has finally decided to slow down a bit. Hy is beloved by the small, close-knit group of ladies who attend the Bible study every week. Everyone was sad when she gave up leadership of our little band of students; everyone wondered what (who) would come next. 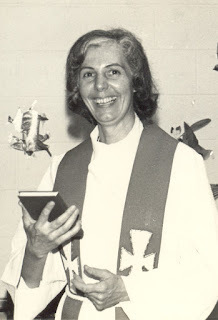 Hy back in the day, one of the first women ordained in the Lutheran church! When no one stepped forward, I raised my hand, which is something I've done all my life. Jesus says something about cutting off offending hands in his Sermon on the Mount. He meant it symbolically of course, but I always think of my treacherous hand, ever raised skyward, offering to do what I emphatically do NOT want to do. And why do I always put myself in these positions? I think it's because I feel so badly for the asker. I put myself in his or her shoes, desperate for someone (anyone) to help, resigned to being stuck heading up the bake sale committee forever. Years ago, I worked up the courage to face the Christ's Lutheran Young Mother's Circle and resign my leadership role after a multi-year run. I made my case for departure, then waited for a positive response from somebody (anybody). I finally burst into tears and STILL no one said they would take over. The group actually disbanded at that point rather than come up with another Head Circle Honcho. At any rate, I am now running the Bible study show. We are looking at the Gospel of Matthew, and as we do I am reminded that I was born Catholic, and Catholics NEVER read the Bible. Our only copy of Sacred Scripture at home was Mom and Dad's wedding Bible, in which my sisters and I colored with crayons. Leave it to Father So-and-So to interpret for me, I figured. After all, he was making the big bucks! My learning curve has been as steep as Mt. Everest. I teach Confirmation. I lead the first grade Bible workshop. In recent years I have been writing devotions, skits and plays for various religious publishers, all grounded in the Word of the Lord. With every assignment, I discover something new. Catholics are taught that Jesus was an only child, but apparently he had siblings! I kinda figured Noah’s Ark and the Garden of Eden were not literally true, but it’s been a revelation (get it?) to read Bible scholars and get some historical background, when these stories may have been first told, and what they were meant to convey. While I don’t reach for it when I am seeking some light reading before bed, my Bible is looking a little tattered these days, a sign that it is in frequent use. And while I have NO desire to become a minister, I intend to keep plugging along, learning more and more about my faith—even if I am destined to stay just one step ahead of my students.